INSTITUTIONAL CASTERS 31/2", 4", 5" dia. Wheels For trucks and equipment carrying up to 1,120 lbs. 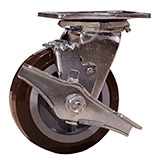 WHEEL BRAKE: Step on wheel brake available on swivel casters holds equipment in place. THREAD GUARDS: Protect wheel from binding with string for longer life with less maintenance.